Laura Ingalls Wilder is well known for her Little House series of books, which have been loved by children all around the world for over sixty years. She was born as Laura Elizabeth Ingalls in the big woods of Wisconsin on February 7, 1867. Laura was the second of four daughters born to Caroline (Quiner) and Charles Philip Ingalls. Laura's sisters were named Mary, Carrie, and Grace. A boy, Charles Frederic, was also born to the Ingalls family, but baby Freddie became ill and died when he was less than a year old. Laura's childhood was spent constantly moving from place to place. Her father dreamed of going West to settle on unknown territory. They traveled into thick woods, across vast prairies, through raging rivers, and over icy waters in their covered wagon. They journeyed from Wisconsin to Missouri, to Kansas, to Minnesota, to Iowa and finally settled in De Smet, South Dakota, where her father claimed a homestead. Laura's parents always saw to it that their children received a consistent education wherever they lived. Although Laura attended several different one-room schoolhouses, she was often taught at home by her mother when school attendance was impossible because of distance or weather. Laura's older sister, Mary, became blind from scarlet fever in 1879, and by the end of 1881 the family had saved enough money to send her to a special school for the blind in Iowa. Laura's schooling continued until she was 16, although she never officially graduated. When she was old enough, Laura contributed to the family's income by working as a seamstress, earning 25 cents a day. In December 1882 Laura received a teacher's certificate and became a teacher when she was only 16 years old. Her first teaching job was a difficult one. It was located in a small settlement twelve miles away from home, and she boarded with a family who was always arguing. The children she was expected to teach were nearly her own age, and Laura felt that she had little control over her pupils. Laura was also extremely homesick. So she was very grateful when a man named Almanzo Wilder, who was ten years older than she was, offered to drive his sleigh through blizzards and freezing temperatures to bring her home every weekend. Laura and Almanzo continued seeing each other for the next three years, and on August 25, 1885, they were married. Originally from New York state, Almanzo's family had moved to Minnesota and from there Almanzo and his brother had gone to stake out their own claims near De Smet. After their marriage, Almanzo filed both a homestead and a tree claim. Unfortunately, the first years of their marriage were full of tragedies. Their crops failed; they went into debt; they contracted diphtheria, a disease which crippled Almanzo; their infant son died; and their house burnt down to the ground. The Wilders moved several times just as the Ingalls family had done, until they finally settled in Mansfield, Missouri on a small farm called Rocky Ridge in the Ozarks. Their house there started out as a small log cabin, but Laura and Almanzo added to it over the years, eventually turning it into a large rambling farmhouse. This is where they were to stay for the rest of their lives. Here they raised their one surviving child, Rose Wilder, born on December 5, 1886. Rose was a bright child who found school boring, so Laura let Rose study on her own at home. Laura later wrote that home is “the best place for teaching many things, first and most important of which is how to think for one's self” (February 5, 1920). Laura's daughter Rose was the embodiment of that sentiment. After ninth grade, she left home to travel and see the world. Rose Wilder grew up to be a journalist, novelist, travel writer, and political theorist who promoted freedom and individualism. From August 1919 until September 1927, Laura was the secretary-treasurer of the Mansfield Farm Loan Association, which allowed local farmers to borrow money from the Federal Land Bank in St. Louis. She handled loan applications and transfers of funds. This job along with her own experience as a farmer provided the background for her first writing attempts. She began by writing columns about farm households for the Missouri Ruralist and about poultry for the St. Louis Star. She also sold a few articles to McCall's and Country Gentleman magazines between 1911 and 1924. It wasn't until the age of 65, at the urging of her daughter, that Laura wrote her first book. When Rose was a child, she had always begged her mother for stories of her pioneer girlhood. Later, Rose encouraged her mother to write down all of her childhood memories on paper. In 1930 Laura wrote an autobiography, called Pioneer Girl. Then she rewrote part of it in 1931 with her daughter Rose's help, and it was released the following year as Little House in the Big Woods . The instant success of Little House in the Big Woods led to the rest of the Little House series. Rose became her mother's agent, editor, and collaborator. They kept in continuous correspondence regarding the shaping of plot, characterization, and style. Rose enabled her mother to create the wonderful series that tells a near autobiographical tale of her life as a pioneer girl. Laura took great care with each book to make sure that the point of view was consistently from that of a child. Most of them were Newbery honor books. Almanzo died on October 23, 1949, at the age of 92. In 1954 the American Library Association established the Laura Ingalls Wilder Award in her honor and Laura was the first recipient. The award is now given every five years to an author who has made a substantial contribution to children's literature. Laura died on February 10, 1957, at the age of 90. A popular weekly television series, Little House on the Prairie , which was based loosely on Wilder's books, began in 1974 and ran for many seasons. More than forty years after her death, children continue to read and enjoy her books. Although Laura's books are based on her life, she did make changes when she felt it made for easier reading; so her books are classified as historical fiction, not autobiography. Pioneer farmers would chew on a handful of grain while threshing wheat, and children helping out in the field often stripped a handful of kernels from the wheat to chew on. Chewing activates a substance in the grain called gluten, turning the mass into a gum-like wad. Try some pioneer gum. All you need is a handful of wheat kernels (available at health food stores and some grocery stores). Put the wheat kernels in your mouth for a few minutes to moisten them, and then chew. Pioneers used to make their own butter. They would leave fresh milk sit out overnight so that the cream would rise to the surface. Then they would skim off the cream and pour it into a wooden churn. The churn had a dasher, which was a handle with paddles on the bottom, built into the lid. Children were usually given the chore of pounding the dasher rhythmically up and down in the churn. (They would often chant: "Come butter come, come butter come, Peter's waiting at the gate, waiting for a butter cake, come butter come.") This separated the butter solids from the liquid buttermilk. The buttermilk would be drained off. The butter was put into a bowl and rinsed with cold water. It was then pressed against the sides of the bowl with a wooden spoon to form a lump. The lump of butter would be sprinkled with salt and stored in a butter crock in a cool place. Pour the whipping cream into the jar. Screw the lid on tightly. Shake the jar steadily and vigorously up and down. Soon you will notice the cream begin to separate into clumps of butter suspended in a liquid. Keep shaking. After about 15 minutes it will turn into a large lump. Carefully pour off the buttermilk, which you can save to drink. Using a spoon or spatula, press the butter against the side of the jar. This squeezes out the last of the buttermilk. Add salt if desired. Put the butter in a small dish or butter mold. Homemade butter is delicious on homemade bread. For a tasty pioneer snack, mix one-fourth cup of butter with one cup of honey. Spread some on toast or a cracker. Store leftover honey butter in the refrigerator. Pioneer Girl: The Story of Laura Ingalls Wilder , by William Anderson. A Pioneer Sampler: The Daily Life of a Pioneer Family in 1840 , by Barbara Greenwood. 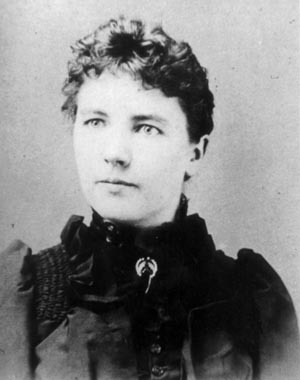 Becoming Laura Ingalls Wilder: The Woman Behind the Legend , by John E. Miller. If You Traveled West In A Covered Wagon , by Ellen Levine. Laura Ingalls Wilder Country: The People and Places in Laura Ingalls Wilder's Life and Books , by William T. Anderson. Laura's Album: A Remembrance Scrapbook of Laura Ingalls Wilder , by William Anderson. Musical Memories of Laura Ingalls Wilder (History Alive Through Music) , by William Anderson. Pioneer Days (American Kids in History Series) , by David C. King. The Prairie Primer: A Literature Based Unit Study for Grades 3-6 Utilizing the "Little House" Series , by Margie Gray. The World of Little House , by Carolyn Strom Collins and Christina Wyss Eriksson. Little House in the Ozarks: A Laura Ingalls Wilder Sampler: The Rediscovered Writings , edited by Stephen W. Hines. Laura Ingalls Wilder, Farm Journalist: Writings from the Ozarks , edited by Stephen W. Hines. The Little House Guidebook , by William Anderson and Leslie A. Kelly. “I believe it would be much better for everyone if children were given their start in education at home. No one understands a child as well as his mother, and children are so different that they need individual training and study. A teacher with a room full of pupils cannot do this. At home, too, they are in their mother’s care. She can keep them from learning immoral things from other children.” ~Laura Ingalls Wilder, Farm Journalist: Writings from the Ozarks edited by Stephen W. Hines (2007: University of Missouri Press), p. 273.